Adventures of the Domesticated Mama: Sashay Scarves! 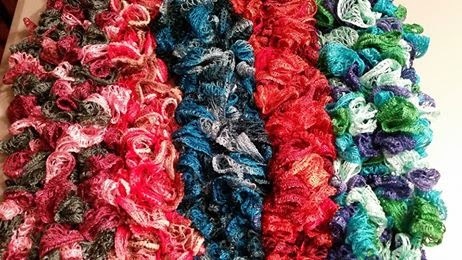 I have been having fun making these lovely scarves here lately..
Those are a few colors I have done and I got more to come. If interested they are $15 each plus shipping. If interested send me a email. I give discounts for multiply orders. Show some love and leave a comment! Do you have a product you need help spreading the word about? If your company would like to have your product reviewed or is interested in hosting a giveaway please contact me . Thanks!